36, of Winterville, N.C.; assigned to the 1st Battalion, 120th Infantry, Army National Guard, Jacksonville, N.C.; killed June 24, 2004 when his Bradley Fighting Vehicle came under attack by small-arms fire and rocket-propelled grenades in Baqubah, Iraq. To honor CPT Christopher S. Cash, his parents, Mrs. Nancy Lee Kelley and Mr. Bob Kelley retrieved this stone from the Veterans Monument Park in Old Orchard Beach, Maine. Each year in the ten years since I played the pipes at Chris’ services, I’ve learned more about your extraordinary son. Every year at the Run for Cash 5k – and at the service in Veterans’ Memorial Park following the Memorial Day parade — I overhear recollections from Old Orchard Beach friends and classmates as they remember special times and events, or rather qualities about Chris that made him special. So when I heard about The Summit Project there was no question; if at all possible I wanted to be a part, I wanted to carry Chris’ memorial stone at the Baxter State Park Memorial Day climb. The air was cool Saturday morning, 24 May, as we started up Owl Mountain bearing our precious cargo. Cool and damp. My stone was carved with the initials CSC – CPT. USA – 1967-2004. I remember thinking how small are those finely chiseled letters and numbers, but how great a man they represent. My stone, a tribute to Capt. Christopher S. Cash, memorializes a soldier whose life was torn away in a vicious rocket-propelled grenade attack in Baqubah, Iraq on 24 June, 2004. As we climbed I thought how different conditions were there at Baxter State Park in May 2014 compared with the hot, arid, dusty Iraq roads ten years earlier. I thought about Capt. Cash, the brave warrior, the soldier answering his nation’s call to protect and defend freedom and liberty. I thought about Christopher Cash, the husband, father, and son of you, Nancy and Bob Kelley, who have become good friends. I thought how tragic it is that this good and brave man lost his life in his prime. I thought about the crushing weight of this loss to his family, friends and to the United States of America. I thought how honored, how privileged I was to have Capt. Cash’s memorial stone tucked safely at the bottom of my backpack. At the top of Owl, about three hours from the trailhead, I thought how appropriate is The Summit Project to provide honor and a perpetual memorial to these Maine soldiers, sailors and Marines who’ve lost their lives in military action since 9-11. I was saddened that the trek was necessary but at the same time grateful and thankful to be an American, encouraged that our nation continues to raise truly remarkable sons and daughters, men and women with qualities similar to Chris’s, and humbled to be a small part of this unique tribute. Nancy – from the moment you arrived to Twin Pines Camp and we hugged I didn’t want to leave your side. Your honesty, compassion, and enormous heart has blessed me and I am privileged to call you family. It was such a pleasure to be able to spend quality time with you after years of quick hellos at Chris’ annual Run for Cash 5k and email correspondence. I carried Chris’ stone to the summit and back but I will always carry and cherish the memories of that hike, your friendship, and forever honoring your son and all of Maine’s Fallen heroes. Thank you from the bottom of my heart. For our freedoms, the families, and the fallen. Maine Heroes are Not Forgotten!! As we neared the finish line we ran harder and faster. Catherine Frost was attempting to take pictures and we did little to help her, Sorry Catherine. We came across the finish line and not in our best time ever, but still leaving everything on the race track. As we finished, I became very ill and certainly used every ounce of energy that I had left in the final moments of the race. Catherine took pictures of all of us. I carried the stone to the gym where we escorted the stone to the awards table. Mrs. Kelley thanked me and my emotions running high, I could do little to not get choked up. We stood by and waited for the awards ceremony. As the song God Bless America was sung. Jodie, CPT Cash’s sister, approached. With tears in her eyes she hugged me and thank me for being there and carrying the stone, she then stated that SSG Weber and I were as close as she could ever be to her brother again. Tears started to form and fell from SSG Weber and I. Nothing could have prepared me for the emotion of this event. This is an event I was proud to be part of. If asked again next year, I would certainly carry the same stone and endure these emotions all over again. RIP CPT Cash, RANGERS LEAD THE WAY. It was my pleasure to travel with CPT Cash on Sept 12, 2015 as part of the Summit Project . A group here at IDEXX called the Patriots Corner gathered at Bradbury State Park to honor those men and women from Maine that made the ultimate sacrifice. The date being Sept 12 was a reminder of how much the country has changed due to the events of Sept 11 2001. One of the major changes was that the lives of brave men and women that served our country became more perilous. Being a vet myself I still am amazed that men and women put aside a safe and comfortable life and join the military. In a recent study I saw that less then 1/10 of 1% of the population volunteers for the military – so the few that do are certainly special. And after reading about Chris he was a stand out in a even in that small crowd. I was honored and moved to accompany Chris to the top of Mt Bradbury and let the warm Maine sun shine on his rock. May God bless and keep all military families that go on after losing their loved ones. On October 17, 2015 I participated in The Summit Project at Acadia National Park. This consisted of about 80 hikers going up Cadillac Mountain on four different trails at the same time, each carrying a tribute stone. I asked Major David Cote for the heaviest stone, and he gave me the honor of carrying Army Captain Christopher Cash’s tribute stone. This stone was chosen by his parents, Bob & Nancy Lee Kelley, and it’s a perfect match for Chris, it’s big, strong, and solid. I learned about his life as a young man, that he graduated from Old Orchard Beach High School, then East Carolina University, and was a member of the Army National Guard. Chris was a great son, husband, father, friend, and soldier. He loved to run, won state titles in track & field, qualified for the Junior National Olympics, and was a fitness trainer. The Captain Christopher S. Cash United States Armed Forces Center in Winterville, North Carolina was named in his honor. The hike took our group of 17 hikers up the South Ridge Trail, 3.5 miles to the top of Cadillac Mountain. It started out cloudy, and a few times we had light rain at lower elevations, but then it cleared and we had bright sunshine for the rest of the day, with nice views of autumn leaves changing color. We stopped several times to put all the tribute stones together in a group, a nice reunion of souls. At the top we each talked about the hero we were honoring, all amazing stories, then the stones were placed together again at the highest point of the mountain. Also at the top was local Girl Scout Troop #667 giving out snacks and drinks in support of The Summit Project. heroes and supporting this project. It was a great day for the memory of Chris Cash, and a reminder of how tragic it is that he lost his life at the young age of 36. I won’t forget you Chris, and now even more people know your life story. This experience with the Summit Project taught me something new about fallen soldiers. On the walk I got to meet new people and spend quality time with friends. Also I met CPT Cash’s mom and she gave me one of his badges. She also invited me to a road race in his honor that is held later this year. I plan on attending and I look forward to seeing her again. CPT Cash’s stone is very big and I carried it the whole way even though people asked to help. It was important to me that I carried his stone. If I had the opportunity I would do it all again. My name is David J. Cote, nickname “Sandman” and on Sunday May 29, 2016 I carried the story and memorial stone of Army Captain Christopher S. Cash, a post 9/11 fallen Maine hero with ties to Old Orchard Beach, Maine, to the top of Owl Mountain on Baxter State Park as part of The Summit Project at Baxter State Park 2016 while a member of TEAM WHITE. The Summit Project is a nationally recognized, Maine based, 501c3 community service organization. On this third birthday of The Summit Project, and already with thousands of miles hiked, hundreds of volunteers and dozens of fallen honored, we have fundamentally changed the way Maine pays tribute to her post 9/11 fallen service members. In 2013, I created TSP because of my personal belief that our state can be stronger, safer, smarter, more connected, more resourceful, more resilient, and more compassionate if we continue the unfinished work of our fallen. I think the measure of progress for those who served and died for us is whether WE remain willing to work together, regardless of our race, class, religion, gender, or political ideology, to be part of something greater than ourselves and overcome the challenges that we face together. With every hike, every new relationship, and every post hike reflection letter (like the one here) we have reinforced that TSP inspires service, strengthens communities and changes lives. This project also reveals the character of Maine – a character of loyalty, service, sacrifice and duty. Most of all, we are proud to deliver on a promise that we make to each surviving family with whom we interact – your loved one is NOT forgotten. Among so many other emotions throughout this experience, there is no doubt that I felt inspired, proud that our communities were strengthened and humbled again to see how my life was changed on May 29, 2016. I am so privileged and honored to have spent this weekend with Chris, a true hero who paid the ultimate sacrifice for the defense and protection of our great country. Chris was with me every step of that hike, and his spirit guided my actions, my interactions and my soul that day. Army CPT Christopher S. Cash, 36, of Winterville, N.C.; was assigned to the 1st Battalion, 120th Infantry, Army National Guard, Jacksonville, N.C. and killed June 24, 2004 as a Company Commander, when his Bradley Fighting Vehicle came under attack by small-arms fire and rocket-propelled grenades in Baqubah, Iraq. He was shot as he shouted from his vehicle for his men to take cover. This is the story I shared with my team. Chris likely saved the lives of others. The highest calling – to lay down one’s life for a friend. I can only imagine what I would have done in a similar situation. Would I have the courage, vision, strength and focus? Chris was posthumously awarded a Bronze Star for meritorious service, a Purple Heart for being injured in battle and a Combat Infantryman Badge. Chris was a fitness trainer at a wellness center, a man fueled by a passion for running and for helping others. He grew up in Old Orchard Beach, Maine. He was a competent, capable, hardworking Commander and he had the ability to inspire those on his team. I attempted to emulate those qualities on the trail. Chris was a great son, husband, father, friend, and soldier. He loved to run, won state titles in track and field, qualified for the Junior National Olympics. He was a competitor and a teammate. I tried to emulate those qualities. I also strived to reflect Chris’s positive energy, mental and physical toughness, his kindness and his giving spirit. Chris was someone who faced adversity and still wore a smile on his face. I think about his mom, Nancy Lee Kelley and all that she has been through, by the way she speaks of her son. I have become close friends with Nancy and Bob and I hope they are comforted that their son is not forgotten with this work. Chris will NOT be forgotten. Ever since I heard about the amazing work TSP does to keep the memory of Maine’s fallen heroes alive, I have wanted to participate in one of the hikes and the time came on October 1, 2016. My son Erik and I headed up to Mt. Desert Island the night before with our backpacks ready. After the early morning wakeup, we headed over to Smuggler’s Den campground, which served as base camp for TSP. Upon arrival, we checked in with our team and met some of our team members. We received our stones, which we’d carry to the summit of Cadillac Mountain. We both carried spirit stones, mine inscribed with “Courage” and Erik’s inscribed with “Commitment”. A quick coffee and muffin later and we boarded the buses to embark on our adventure. Once we got to the trail head, we assembled as a team and introduced ourselves to one another before stepping off. As the trail wound its way up the side of the mountain, there were stories exchanged, laughs shared and quick friendships forged. We stopped along the way to snap pictures and take in the sights of beautiful Acadia National Park, all the while remembering those stones, heavy on our backs and the mission of TSP in our hearts. After about 2 hours of climbing, we reached the summit of Cadillac and found a quiet spot to have our circle ceremony, a time where hikers reflect on the stones they have carried along the way. Most people on our team carried the stone of a fallen Maine hero and had learned as much as they could about the life and service of their hero, which they were about to share with the team. Circle ceremony is what TSP is all about and nothing really prepares you for the emotions that will flood you, once people start sharing their stories. Some team members were gold star family members, carrying the memory and stone of their loved one, and hearing their stories was heartbreaking but also beautiful. For me it brought home the meaning of the stone I carried. COURAGE was shown by those family members, not only on the hike, but every single day of their lives since loosing their loved one. It takes courage to carry on, courage to remember and courage to share those private memories with others. There were many tears, some light moments and a deep sense of comradery within our team. As team members shared the story of their hero, the mission of TSP came to life – remembering our fallen and ensuring that their legacy lives on. There were so many stories of so many people who gave their life, serving our country, showing what courage and commitment is all about and we all came away with a deeper understanding of what these heroes have done in their lives and continue to do beyond their passing. By keeping their memory alive and telling their stories, their legacy carries on and they continue to have a lasting impact in people’s lives. My son and I were humbled to be part of this experience and will ensure that we continue the mission of TSP by sharing our story with our friends and families! Maine Heroes Are Not Forgotten!!! I am a middle school student from Scarborough and I did this hike with my mom. I carried the Commitment stone on the hike up Cadillac Mountain. This was my first time with the Summit Project. This was also my first time hiking Cadillac Mountain. I enjoyed doing this hike and meeting with the gold star families. I think it was great that the girl scouts do this event every year, and I look forward to doing the same. My favorite part of this hike was when our group stopped halfway and took a picture of all of the stones sitting on a boulder. 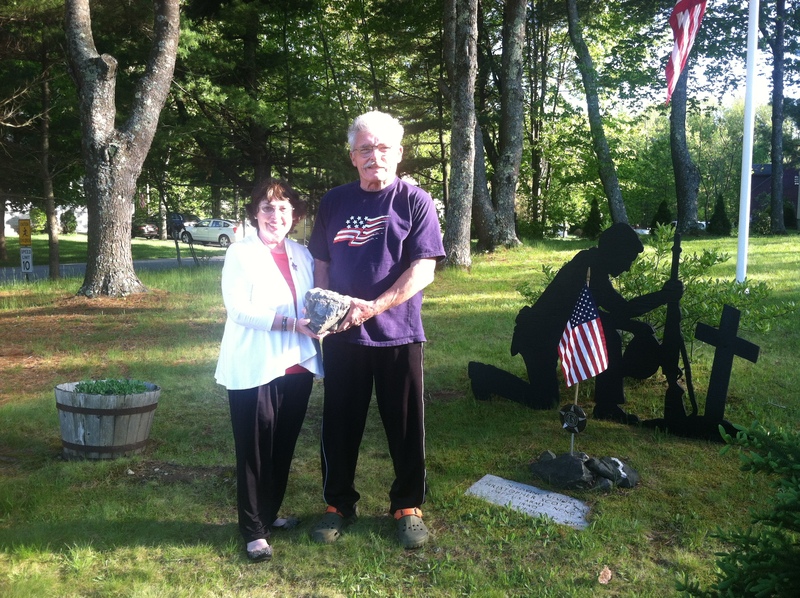 I think that the Commitment stone represents the commitment of all of Maine’s armed forces, retired and in active duty. It also represents our commitment to not forget those heroes who lost their lives fighting for our country. At the circle ceremony at the top of the mountain, it was sad to hear about all of these brave soldiers that died since 9/11. It was a very emotional event were gold star families and others could come together to honor our state’s military heroes. I was with the group that had a news-person along, and we stopped a few times so he could interview some of the people involved in the summit project. I took my camera along and took lots of pictures of the beautiful area around Mt. Cadillac. It was amazing that people come from so far to be a part of The Summit Project. There were a few young kids too. One stone being carried was a rubber penguin, because the soldier had no stone yet. At the end of the day, we stood in a circle and passed the stones to the families. I was surprised at how many people there were. I thought this was a great event and I can’t wait to do the hike again next year! I had the honor to carry the stone and the story of CPT Christopher S. Cash. I have been waiting a better part of the year to walk with Christopher. I had first heard of TSP a couple years back but I really got involved at the start of 2016. At that time I was Unit Director of the South Portland Boys and Club and we were blessed with the responsibly to protect the Honor Case. One of our club members was assigned Christopher’s stone and he did a wonderful job carrying his story. I had the honor to meet some of Christopher’s family that day and I immediately felt a connection with him. I would be lying if I said I didn’t like having a particular role and added responsibilities in things. I truly enjoy being in a leadership role. Id also be lying if I told you I didn’t like a challenge. The size of Christopher’s stone drew me in from the start. It just seemed larger than life to me. After making that connection with Christopher’s family and seeing his stone in person, I knew we were bound to be paired together someday. Well that day come on 10/01/16, when I had the responsibility of Team Lead for 18 other hikers as we climbed up to the summit of Cadillac Mountain. From what I’ve learned, Christopher was an incredible leader. He was also one heck of an athlete and competitor. Physical fitness was his passion and so was his family. This is everything that I strive for in my own life. We have the same interests and the same passions. I honestly believe the stone choses you and Christopher and I were meant to complete this mission together. We got everyone to the top safety, everyone shared their amazing stories in their own way and the day was perfect. Everything that I said about Christopher came straight form my heart that day. Since the time of this letter and the Acadia hike, I’ve been out of the trails solo hiking a couple mountains. So I’ve had a lot of time to reflect on that day. I want you to know that just because I handed the stone back off, that doesn’t mean I will stop carrying Christopher’s story. I will think of him often, I will continue to share his story and he will always have real estate in my heart. Christopher is a hero and it was an honor to walk with him. Ps. I look forward to participating in the Run for Cash in 2017. On October 20, 2016 I participated in The Summit Project by hiking Streaked Mountain. There were about 20 hikers going up on Streaked Mountain. I went with my classmates from Mr. Theriault’s, American History class.Mr. Theriault gave me the stone of Army Captain Christopher Cash. He was an army, in Baqubah, Iraq and He was trying to save our lives that’s why we’re carrying his rock to remember him. Thank you Christopher for everything you did for our lives, if you hadn’t fight for us we might not be safe. On March 11th I along with a number of Cape Elizabeth, Maine residents carried stones to remember the fallen heroes of our country. I had the honor of carrying your son’s remembrance stone as we walked the three miles along Shore Road beginning at the Thomas Memorial Library and ending at the Portland Head Lighthouse in Cape Elizabeth. As I walked along the path I had time to reflect on your son’s service and his sacrifice. When we arrived at our destination we gathered and read out loud the short biography and story that accompanied each stone. My thoughts and reflections that accompanied me as I had walked only became more real and imbedded in my soul and heart. Cpt. Cash was once a name but this afternoon Chris became a living memory which I will remember for ever. All the other fallen heroes I heard about that day will also have a special place in my heart. It was an honor to carry your son’s memory with me and I would like to know I will always carry him and his family with me forever. My name it HM3 Lombardo. I was honored and pleased to meet Nancy and Bob at a friends house prior to the hike and I was deeply honored when I was asked to carry Cash’s stone for a 5K held in his memory. He has a huge stone. I had never hiked Katahdin before and I think I put way to much gear in my pack. It was an honor to struggle up the mountain with his name on my back. I was so happy to have heard first hand from Nancy and Bob what kind of man Christopher was. A good way up the mountain I thought I wasn’t gonna make it up. Then I remembered that Christopher went down fighting. Leading his men and facing the enemy head on. There was no way I could quit. I carried two warriors up the mountain and it was probably one of the most motivational hikes I’ve ever been on. I hope and pray that I may do my part for my country and live a life filled with honor as Christopher did. I look forward to seeing you at the 5K and running in the memory of a great warrior. Back in June when we met at the 13th annual Run for Cash, I promised to ensure we kept the memory of Chris alive. Part of the Rangers Creed states that we “will never leave a fallen comrade.” On Saturday September 16th I carried the Cash stone during the Capitol Tour 2017 and shared his story with the team. I am so incredibly honored to help you keep his memory alive as he was truly an American Hero and an inspiration to so many in his community. On Saturday, October 14, 2017 I had the honor and privilege to carry the memorial stone you chose for your son, Christopher. We hiked in Acadia for the fall TSP event. It was a beautiful fall day. We had 14 people on our team including one very lively 8 year old boy and my sweet dog, Lila who was a last minute addition. I’m so glad we had a child with us. I remember you telling me, Nancy, how Christopher loved children. I thought it was very fitting for our day to have the enthusiam of this young boy with us and how Chris would have enjoyed this. Many were new participants. We started as a team and ended as a team. Taking breaks as needed and looking out for each other. We were Team Tarn and hiked up Mt. Dorr to our final destination of Cadillac Mt. where we did our sharing circle. The foliage was the perfect backdrop for our hike and I couldn’t help but think about Christopher and his sister, Stacey who were both born in October and on the same day but different years and how special that must have been for your family. As we hiked, I was thinking about both of you attending your granddaughter ‘s wedding the same day. I’m glad you had this beautiful event to celebrate. It has been such a pleasure getting to know you over these few years. I especially enjoyed the time you came to our house to share about Chris and meet our friend who had recently carried Chris’s stone for the Jetport walk. You both do so much to keep Chris’s memory alive so he can be remembered for the smart, strong and brave son, soldier, husband, father, brother and friend he was. As I shared about Chris’s life during our circle at the top of Cadillac, I remembered that he would have turned 50 on October 2nd this year. What a milestone that is for those of us who reach it. I kept thinking about how Chris and your family may have celebrated that day had it been so. I want to thank you both and your family for your friendship and willingness to share your amazing son and all his accomplishments with me and The Summit Projet community. Remembering Chris and honoring his service, his legacy and his sacrifice was truly my honor and a gift I will hold in my heart forever. My name is Meagan Whitten and I had the honor of carrying Christopher’s stone to the summit of Tumbledown Mountain. I’m going to be totally honest and tell you that I chose Christopher’s stone because it was one of the largest ones there was. However, it was not because I wanted to show up my peers or because I wanted to prove to people I was strong. I chose it in this manner because I felt that it was the least I could do for someone who paid the ultimate sacrifice for me and the rest of our country. I wanted to put the weight on my shoulders that those who died for us and those who are still fighting felt and feel every day. The weight of leaving a family behind. The weight of seeing comrades fall. In the case of Christopher, the weight of putting down his life to save others. For him it was probably a snap decision to call to his comrades, and though my decision was much easier, I knew this was the stone I was meant to carry. I myself know how it feels to have family in the military. My grandfather was in the Vietnam war and he once told me that his best friend laid down his life to save my grandfather. This was before my father was even born so if he had not done so, I would not be here today. I do not know this friends full name, only that my father was named after him. Christopher has allowed me to have that connection to someone. A person I can thank for saving the lives of others. A name and a face that I can give my gratitude to. When I read about Christopher I saw that he enjoyed running, and though it isn’t the same, I believe he would have enjoyed the climb up Tumbledown Mountain. The landscape that can be seen from the summit is astonishingly beautiful. There was a beautiful body of water surrounded by other mountains. The sky was clear and deep blue and far off in the distance a line of wind turbines could be seen. There was even a pond near the top of the mountain that a few of my classmates went fishing in, however only one person caught anything. There were even tiny waterfalls on the rocks as we climbed. This was the second time I climbed Tumbledown and both times were meaningful. The first time was in honor of 9/11 and we carried a makeshift flagpole to the top. For this reason Tumbledown will always be close to my heart. In the future if I ever climb it again, I will think of Christopher the whole way up and the whole way down. He has made is mark on my world without even meeting me and I will always remember him. On Saturday, the 29th of September I joined the Summit Project at Acadia National Park on their yearly climb of Cadillac Mountain. I had the honor and the privilege to carry the stone and the story of Army Captain Christopher S. Cash, a fallen Maine hero with ties to Old Orchard Beach, Maine. I hurriedly set out on researching Captain Cash who had grown up in Old Orchard Beach and passed away at the young age of only 36. Captain Cash was assigned to the 1st Battalion, 120th Infantry, Army National Guard out of Jacksonville, North Carolina and had been training local police during his 3 months prior to June 24, 2004 when his Bradley Fighting Vehicle came under attack by small arms fire and rocket propelled grenades 35 miles North East of Baghdad. He was killed in action that day as he called out to his men to take cover. One other was killed that day and 7 more injured. Captain Cash graduated from old Orchard Beach high school in 1985. He excelled at track and field/cross country, winning several state titles and even qualifying for the Junior Olympics in 1984. Captain Cash’s love of sports and wellness lead him to earn his bachelor’s degree in fitness education and later a masters in exercise physiology. He was a soccer coach, ran marathons and managed a large fitness facility in North Carolina. It was said Captain Cash was somewhat impulsive. There is one story about him having enlisted for his military service out of the blue while on vacation in Texas in 1987. He completed 4 years in the 82nd Airborne Division at Fort Bragg as an Army Ranger and continued his 17 year military career in the Army National Guard. Captain Cash’s friends described him as powerful and extremely competitive. A “go big or go home” kind of guy. He was both physically and mentally tough and a born leader. He was a role model to many and someone that always inspired others to be and do their best. He was a son to Nancy and his step farther Bob. A husband to Dawn. A farther to Christopher and Matthew. A brother to Jodi and Stacy. A friend to many. A soldier. A hero. I felt guilty and wanted to know more about the man whos name was engraved on the stone I was about to set out on my journey with. As the day started I was uneasy as I made this journey not only last minute, but also by myself. I must say the group made me feel welcome right away. Thank you Joelle, Jill, Kayla and Chrissy! Everyone was so friendly and made me feel at ease right away. As I made my way to the tent where the stones were waiting for us I felt a flood of emotions that I cannot put into words. Little did I know it would be the first of many that day. We all found our teams and got ready to load up on the busses. I couldn’t help but admire the symbolism of the 4 teams of close to 80 individuals all taking on Cadillac Mountain from the North, South, East, and West before converging at the top. I carefully wrapped and packed Captain Cash’s stone in my pack. I couldn’t help but think that Nancy and Bob had made a good choice in picking out the stone that had come from Veterans Memorial Park in Old Orchard. It was absolutely beautiful out that day . The fall colors had started to show and it was so clear that you could see for miles. A perfect fall day! As we made our way to the summit I could feel Captain Cash with me as the weight of the stone shifted in my pack. I am sure that he would have gotten a good laugh out of me trying to keep up with the team with the weight of his stone. Sometimes I could feel it pushing me forward as if to encourage me. All the way reminding me that he was there. Once at the summit, it was time for the “Circle Testimony” where each hiker shares the life and the story of their fallen hero they carried. I must say I was not prepared for the raw emotion . How do you sum someone’s life up in a few minutes I thought to myself. So worried that I was not going to be able to give Captain Cash or his story the justice that it deserved. Only being able to share small tidbits of a life that was cut short in the pursuit of defending our freedoms. As I sat and waited for my turn to share Captain Cash’s story it was all I could do to hold the tears back as we made or way around the circle. The stories of all that had passed serving our country. One after the other we told just small excerpts of their lives with quivering voices, tears and small moments of silence where we each had to regain our composure to press on. One of the things that hit me the hardest was the number who had passed due to suicide. Wishing they could have gotten the help they needed. Having fought for our county and done so much for so many, but felt so alone and thinking it was the only way out. My heart was broken even further. I must say the day was both physically and emotionally draining, but in a good way. I laughed and I cried. It truly is a day I will never forget. Thank you all Team Blackwood for allowing me to join you & thank you Captain Cash for making the ultimate sacrifice so we may all live free.